Teens are renown for always being hungry, for eating their families "out of house and home". But it's also true that teens are hungry for GOD! We do everything we can to support our teens in remaining faithful to Christ and His Church - in being and living as disciples of Christ in the world today. On Sundays from 10 - 11 AM we meet in the KAC Meeting Rooms to discuss a variety of faith topics over coffee and danish. We hope you will join us soon! No registration is necessary. Learn more by contacting Deacon Gerry Flamm. Devotions are spiritual practices that help individuals incorporate the Faith into their day-to-day lives. They may seem simple, but they can be quite powerful! Sincerely engage in a devotion for a month or two and see what a difference it can make. If you enter the main doors of the church, the library is in a room off to the left. The shelves are labeled to help you find books for particular topics. To borrow a book, simply write your name on the book card that you'll find in the back of the book and put the card in the metal box you'll see on the shelf. When you're finished you can leave the book in the basket on the small table; we'll take care of re-shelving it for you. A selection of audio and visual tapes as well as some additional display books are available in the lobby area of the church. Tell me more. High School Youth Connection is an opportunity for teens to develop a community of disciples and continue to strengthen their faith in a way that resonates with their age and development. We have regular Sunday night meetings for fun, fellowship, and faith learning. We also go on a yearly mission trip. We have many fundraisers that not only help subsidize the mission trip, but also help to build community both with the teens and with our entire parish community. We also have various service and fun activities throughout the year. We gather on Sunday evenings for an hour or so. Feel free to contact Amy Staubach if you have any questions. Through our mission trip, teens move out of their comfort zone and assist others in need while deepening their Catholic faith. During the day we travel to work sites and assist with everything from home repair to new home construction to yard work, painting, or anything else that needs to be done for families in need. In the evening we foster spiritual growth through activities, faith sharing, and prayer. This experience can be life-changing for everyone involved! 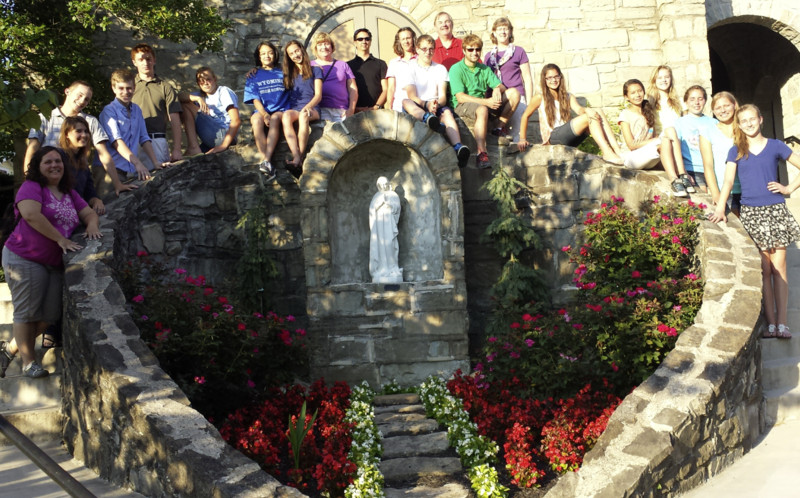 2014 Mission Trip to Hazard, KY.
*These opportunities are open to all parishioners, not just teens. In the Archdiocese of Cincinnati, all staff and all volunteers who work with children are required to attend Child Protection Training, have approved background checks, and stay current on monthly bulletins regarding child safety and protection topics. To learn more, go to the Archdiocesan site.